In-house capabilities provide a competitive edge to create total solutions. We offer effective solutions for one piece up to 100,000 pieces. 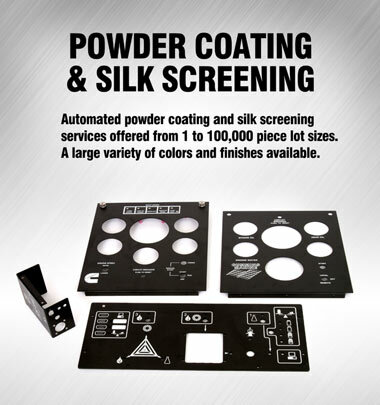 Cannon offers automated powder coating and silk screening services from 1 to 100,000 piece lot sizes in a large variety of colors and finishes. Cannon offers a fully automatic powder coating line including a three-stage washer, overhead conveying system and GEMA powder coating equipment. Our capabilities include coating components that are up to 4 feet wide, 6 feet tall and 14 feet in length. The silk screening business is a compliment to our wet paint, powder coating capabilities. In-house, fully automatic powder coating line makes us cost competitive. Ability to provide powder coating services for very large components. Silk screening of intricate parts.